How Do I Email Invoices Electronically in Sage 100? Sage 100 Question: Mike, how can I setup Electronic Delivery Invoicing in Sage 100 for Accounts Receivable. Sage 100 Answer: As a seasoned Sage 100 Certified Consultant this question is one that will delivery much efficiency to your organization. You will be able to eliminate paper printing time, the cost of paper and postage and make things very simple for you customers. As always, if you are unclear about any of these instructions or have concerns on how this will impact your Sage 100 system, it is recommended that you contact your Sage 100 consultant. If you don’t have access to one, we are here to help. Please see our blog for more helpful Sage 100 tips. Step 1 – In order to “go paperless” it’s necessary to first ask your customers if they would like to start receiving electronic invoices PDF’s? It’s just a matter of sending an email to get a simple agreement. Ask your customers to verify what email the invoices should be addressed to and you are ready to get started. A simple list can be obtained including the customer number. This list can be imported into Sage 100 with Visual Integrator, or they can be manually entered as well if you would like. Step 2 – The example shown is for Accounts Receivable, but this method can be used for any of the Sage 100 forms. 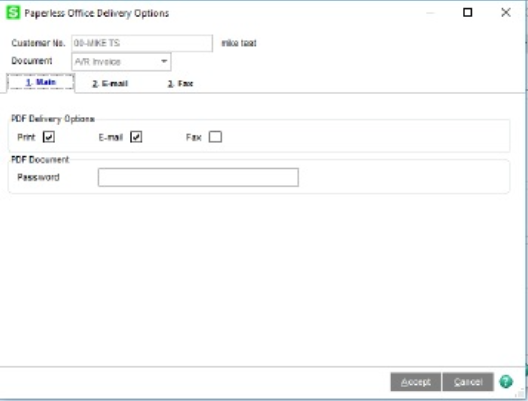 Step 3 – You will need to first setup the Paperless Office: Modules>Paperless Office>Setup>Paperless Office Options and make sure the Forms and Customer Viewer buttons are checked. 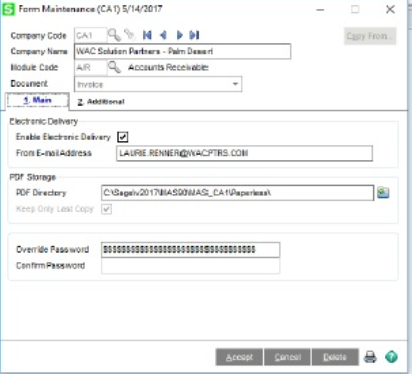 Step 4 – You will need to setup E-mail preferences for Company Maintenance, Modules>Library Master>Company Maintenance, select your Sage 100 Company and then tab 4, E-mail. 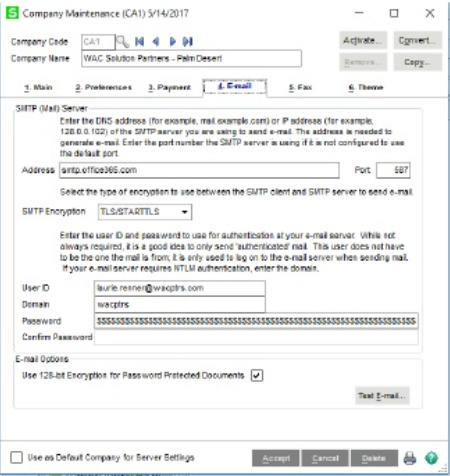 Select the STMP, Port, User name, Domain and Password. This will be for your email system. The example is for an Office 365 email system. Once setup you can click the Test Email button to make sure it all works. Step 5 – Setup the Form Maintenance for Accounts Receivable invoice: Modules>Paperless Office>Setup>Form Maintenance. Enable Electronic Delivery, add the From Email address, password and set the location of the PDF Directory. 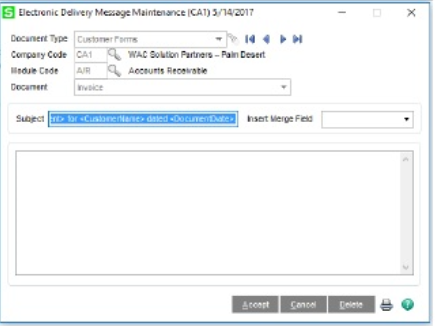 Step 6 – Setup the Electronic Delivery Message Maintenance: Modules>Paperless Office>Setup>Electronic Delivery Message Maintenance. And set it up for Accounts Receivable Invoice. Step 8 – From inside of Customer Maintenance you will need to click on the Paperless button, select the Document to be A/R Invoice and on the Main Tab click to Print PDF and E-mail. 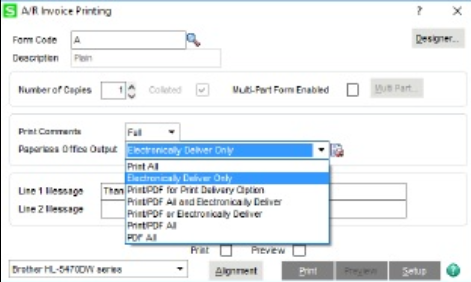 Step 9 – Now when you select to print and Accounts Receivable invoice you will have options to Electronically Delivery Only, Print to PDF and Electronically Deliver and Print to PDF or Electronically Deliver. This will give you many options for printing. At this point you can test a couple sample invoices to may sure it all works. Mike is an expert on Sage 100 ERP with over 25 years in the accounting software industry. Mike is also a Sage Certified Trainer and a recognized leader in the design, implementation and support of ERP systems, including Sage and Acumatica. Please note: This is a repost of a blog that was written for ERPVAR.com, the original blog can be found below. http://www.wacsolutionpartners.com/wp-content/uploads/2013/07/wacsp.png 0 0 Mike Renner http://www.wacsolutionpartners.com/wp-content/uploads/2013/07/wacsp.png Mike Renner2017-05-26 17:42:472017-07-07 16:19:40How Do I Email Invoices Electronically in Sage 100? As a Sage 100 (formally MAS90) Certified Consultant I am asked by our customers every year about which forms to use for W2’s and 1099’s and printing of those forms. This blog is a simple review of the forms and the steps required, so it will not be so difficult determine the steps each year. For the W2 and 1099 forms, you will need the 4 perforated forms for the recipients as well as the other required forms from the IRS. There is a very good knowledgebase article at Sage’s support website that is linked below that will tell you exactly what forms you need to purchase. Sage 100 current versions uses Aatrix a service that is employed by Sage and as long as you have a current Sage support/maintenance plan in place the service is available. Once the form comes up click on the W2/W3 form and click Accept, if the current year W2/W3 report is not there, it means that you will need to do the Automatic Update on the form that comes up next to get the correct forms to load. Aatix updates the forms on a regular basis so if there are new forms you will want to do the Automatic Update. To complete the W2 printing you will want to follow the steps on the Aatrix form to completion. It is a very simple step by step process mostly just clicking the Next Button and printing the forms. 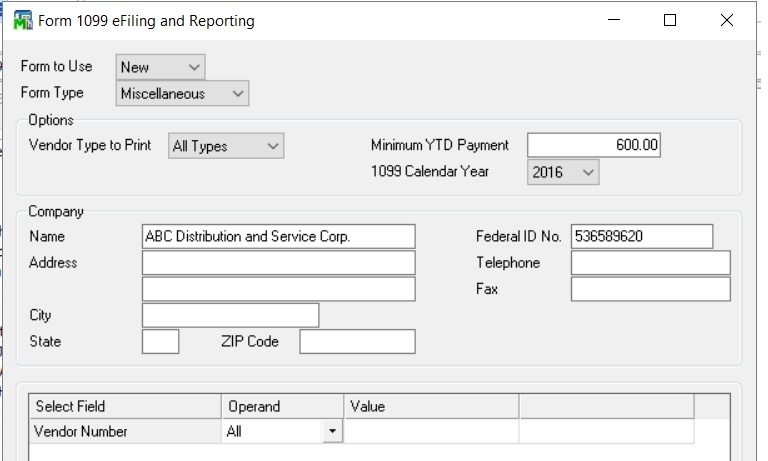 On the 1099 form set the Form type as Miscellaneous, the correct year and Minimum YTD amount to $600. Then click Accept. If there are new forms you will want to click the Automatic Update button on the next screen. On the 1099 Setup Wizard you can choose the test drive for print the 1099’s. First time through would suggest you test drive, and do some sample prints to plain paper. Click Next and there will be a series of question to answer in the Wizard, usually the default answers will be sufficient. The screen will show Verify Recipient Verification info in spreadsheet format. You will click the green next buttons verify and the information, if there are errors in the data Aatrix will error and require correction before moving forward. Things like you do no have a Tax ID number and it will be highlighted in red. You should continue to click the green next button. If you want to enroll in Aatrix’s eFiling you can do that, click next the get past the Ads. 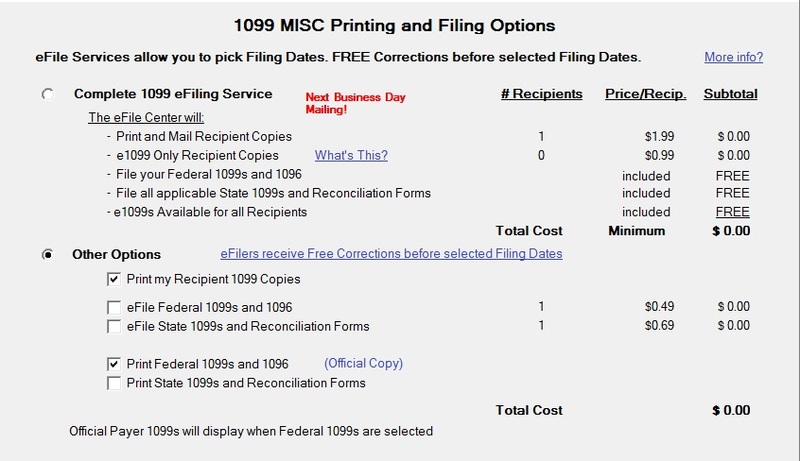 At the Print Options page select Other Options and select the print the 1099’s and 1096. Then click next four times. Aatix will preview the 1099’s on the screen, you can click print final, Aatix will instruct you with the type of paper to insert, print and then click next step. The system will repeat this process until you are done printing the 1099’s. You are done at this point. In NetSuite, there is a very useful tool called “Memorized Transactions”. This tool lets you set up and automate recurring transactions. One example is a recurring payable such as rent. Memorized Transactions can also be used manually as templates for repeated transactions which may differ from period to period—for instance, payroll journal entries. In this blog, we will show you how to use this valuable tool! Let’s create a recurring bill for our vendor, Safety Net Security (SNS). SNS does not send us an invoice every month, so we have remember to pay them on time. We want to set up an automated payable for them. Begin by filling out a bill for SNS as you usually would. Don’t click “Save”! Instead of clicking save, hover over “Actions” and select “Memorize”. 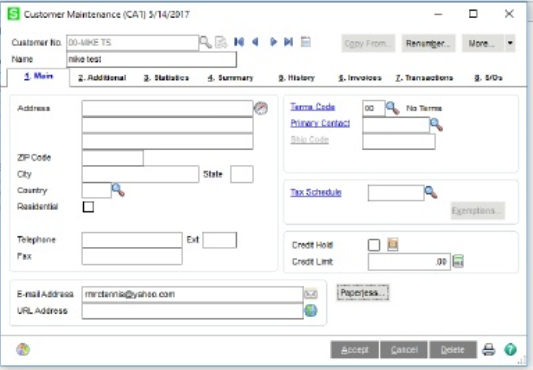 On the next screen, you will be able to set options such as frequency, how many times the transaction is to be performed, and whether NetSuite reminds you to do it or automatically performs the transaction. When you have set the options you want, click “Save”. Use the Global Search to find the page named “Memorized Transactions”. So how about using a Memorized Transaction as a template? Set up a memorized transaction as displayed above, but stop when you reach Step 3. Select “Remind Me” and set frequency to “Never”. Make sure you name the transaction something distinctive. When it comes time to use this template, locate your Memorized Transactions list as described above. When you get there, click on “Enter” next to the transaction you want to use. You may now fill in the pertinent information. NetSuite has so many helpful tools that it can be hard to know what each does. Memorized Transactions can help take a lot of the work out of regularly repeating transactions. If you have any questions about Memorized Transactions or other NetSuite questions, please contact us! Q: We are a Sage 100 2016 user, how can we install Workstation setup on one of our networked computers. A: First of all on the server that the Sage 100 2016 program is installed you will need to do a Share of the folder above the MAS90 folder. Example parent folder of the MAS90 folder might be called Sage 2016. 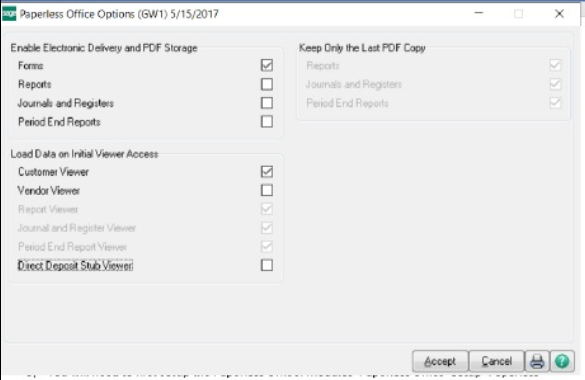 You will want to right click on that folder, share it and give full permissions for the users that will be accessing Sage 100. You will then log onto the Workstation that you will be running Sage 100 on and do a mapped drive to the parent folder, such as M:\Server1Sage 2016 which should then give you access to the folder. You will want to click down to the MAS90wksetup folder and then run the Setup.exe program as an Administrator by right clicking on the program icon. Question: Is there a way you can apply a prepayment in a customer to an actual customer invoice? Open Accounts Receivable, Main, Cash Receipts Entry. Enter a new batch number. Select an existing batch number. Click the Next Batch button. Add a Comment and Accept. In the Cash Receipt Deposit window, enter or click the Next Deposit No. button. Note: The next deposit number is stored on the Entry tab in Accounts Receivable Options. Enter the deposit date (this date should be the same date as the ORIGINAL Cash Receipt that you are reversing.). Enter the cash deposit amount as a Zero. Accept. Leave the amount to be as a Zero. In the First line, select the Prepayment from the Invoice look up. In the Second line, select the Invoice that the prepayment was applied to, and make sure the amount posted is the same as the Prepayment but a positive number. Click Accept to save the entry. Print and update the Cash Receipts Journal. Once this is posted you will be able to look in Customer Maintenance under the customer and see that the invoice amount has been reduced by the amount of the Prepayment.